Happy 4th of July weekend! Anyone have any fun plans? Houston is dealing with the remnants of Hurricane Alex, and it is looking like our holiday weekend will be filled with heavy thunderstorms. Never mind the weather -- we'll be sharing good food with good friends no matter what! On the list: making vanilla bean ice cream, baking pie, and grilling. I think it is about time that I post our favorite pie crust recipe. The only way it differs from a normal pie crust is that it uses a little cream cheese, which adds a slight tang and a flaky texture without having to resort to shortening or lard. (Not that I'm opposed to real, rendered leaf lard. Leaf lard makes incredible pie crust but it is a little hard to get.) It takes a little advance planning, and a lot of butter, but the resulting pie crust is pretty great. Mark's pie is somewhat legendary in my family. 5 or 6 years ago, we made Thanksgiving dinner for my family and Mark's friend Fharhad. I spent days planning the meal and hours grocery shopping and cooking, while Mark made the pies. We sat down to eat and, there I sat, ready to bask in praise and thanks for having made such an extraordinary meal. Of course, no one said anything (and, in fact, I explicitly remember my cranberry-orange relish went totally uneaten). Then, then the pie was served. I can't even explain to you the level of rapture with which Mark's pies were received. It was disgusting. I've since gotten over my bitterness, because his pie really is that good (though, seriously, would it have killed anyone to try my cranberry relish?) Anyway, the pie crust recipe he used was -- of course-- from Rose Levy Beranbaum. Mark is a big fan of RLB's recipes. It's not hard to understand why, if you know Mark and if you glance at one page of any of her books -- she is extraordinarily precise in her measurements and instructions and she never cuts corners in the pursuit of perfection, even if it means that a recipe takes 8 hours. Mark is a total perfectionist and RLB has earned his trust: trust that the end product will be amazing and correct (for example, her kougelhoff is almost as delicate and wonderful as the version at Ladurée) and trust that the techniques have been refined and adequately tested. Before I met Mark, my pie universe was limited to store bought pie and pumpkin pie, which my mom, sister, and me made every year for Thanksgiving. Mark, a Washington State resident and serious sour cherry pie fanatic, took it on himself to open my eyes to the wide and wonderful world of homemade pie. * As did his parents, fruit fanatics themselves. [You might even say the fruit doesn't fall far from the proverbial tree... that's right, I said it.] Every time we visit, a pie is cooling on the counter and we get the best gifts ever: freshly picked and home canned Washington state sour cherries, blueberries, apples and apple compote, plus addictive dried apple chips. *For clarifying purposes, here is a very accurate depiction of our first conversation about pie. Me: Hey, want to make a fruit dessert? Me: Pie? Sure, I like pie. Pumpkin pie is nice. Chocolate cream pie isn't bad, either. You know, like at Waffle House? Mark: THOSE ARE INFERIOR PIES. Me: [gamely] Well, we could try to make peach pie or something! Mark: SOUR CHERRY PIE IS THE END ALL AND BE ALL. ACCEPT THIS TRUTH OR BE KILLED. Place the flour mixture in the bowl of a food processor; pulse for a few seconds to mix well. Add the cream cheese and process for about 20 seconds; the mixture should resemble coarse meal. Add the frozen butter cubes and pulse just until none of them is larger than a pea. Add the heavy cream and vinegar; pulse to process the mixture into pea-size pieces. Divide the mixture in half and transfer to 2 separate 1-gallon resealable plastic food storage bags. (If desired, spray the inside of each bag with nonstick cooking oil spray to keep the dough from sticking. )Working with one bag at a time and leaving it unsealed, knead the mixture through the bag by pressing with the heel of your hand to help the dough come together. Remove the dough from the bag and knead it lightly just until it is slightly stretchy when pulled. Flatten the dough into a disk, wrap it in plastic wrap and refrigerate for at least 45 minutes and up to overnight. When ready to make a pie, remove 1 disk of dough from the refrigerator. Allow it to sit for up to 10 minutes, if necessary, to become pliable enough to roll. Cover the work surface with a large pastry cloth and lightly dust with flour. Cover a rolling pin, preferably chilled or cool, with a cloth cover and roll the dough to a circle about 1/8 inch thick by 12 inches in diameter. (Alternatively, roll the dough between 2 large sheets of plastic wrap.) The dough should be smooth and cool. Fold it carefully in half, then again into quarters and transfer to a 9-inch pie plate. Unfold the dough and trim the border just short of the edge of the plate. Cover with plastic wrap and refrigerate for at least 30 minutes and up to 3 hours. Note: 3 tablespoons of instant tapioca will yield a very gelled pie filling. If you want a juicier pie filling, feel feel to try less. I think 2 or 2 1/2 tablespoons will yield a somewhat juicier pie filling, but any less may be too juicy. 1. Preheat oven to 400 degrees Fahrenheit. Add the tapioca to a spice or coffee grinder until the tapioca balls turn to powder. This helps the tapioca to dissolve evenly. Combine the rhubarb and the strawberries with the sugar, tapioca, salt, and orange rind. Let sit for 10 minutes. 2. Turn into a pie dish lined with pie crust (see steps above). At this point, you can fashion your lattice on top (you can find a tutorial here). Mark likes to form his lattice on a silpat liner and, after a few minutes in the freezer to firm everything up, you can easily pick up the lattice and place it on the pie. Trim the edges and crimp the top and bottom edges together. 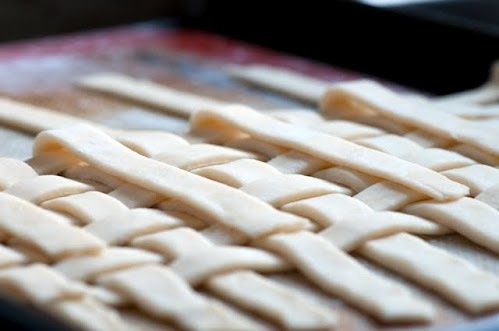 (Note: If you don't want a lattice top, simply drape the second pie crust on top of the filling. Trim the edges and crimp the top and bottom edges together. You will need to cut slits in the top to allow steam to escape.) In either case, brush a little beaten egg yolk over the top crust and edges. 3. Bake at 400°F for 20 minutes. Then, reduce heat to 350°F and bake an additional 30-40 minutes longer (40 to 50 minutes longer if doing a 10-inch pie). 4. Let cool on a rack at least 1-2 hours, preferably 4 hours. In my opinion, it is really best to allow the pie to cool to room temperature to let the internal juices thicken. If you like an oozy pie, however, dig in (after an hour or so). 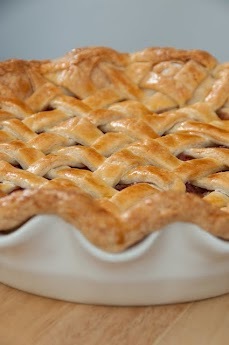 Agreed about sour cherry pie being my number one favorite pie now too! Sour cherry pie season is way too short, though. This was a read aloud post. It cracked Nathan and me up! Also, this makes me want to never take a shortcut again, though I don't know how practical that is with my life right now.... Which is worse? To eat a shortcut pie or not to eat pie?!!? Ha, I'm glad I finally admitted the truth to the world! I hope YOUR family is duly appreciative of your efforts. And that Nathan never upstages you. When mark made the lattice, that was why we had leftover pie crust right? But this recipe will definitely make enough for a bottom PLUS the lattice top? yes! the recipe makes enough for a top and a bottom crust. there will be a leeetle pastry crust left over. you can use it to make empanadas, or just bake and dust with sugar. The field of the main story has been fixed for the use of the reforms for the people. The judgment has been determined for the use of the professional research paper writing service in the official account and term for the use of theorems for the people in life.